"The Trials of Christ" by John Gilmore is a profoundly interesting and insightful read. The subtitle is: The moral failures of those who judged Jesus (speaking about - Annas, Caiaphas, Pilate, and Herod Antipas). This book is interesting because the subject is quite heavy and tedious but Dr. Gilmore boils it down for the average man. He champions the Gospel of John and the rest of the Gospels for that matter, as faithful eyewitnesses about the two types of courts that Christ had to endure (Jewish and Roman). 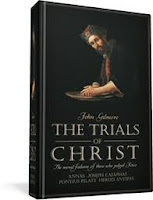 Insightful background information about the trials, and the leaders, the times, etc. If you are not interested in cumbersome reading, then this is certainly a book you will want to read. I like it when an author takes away the burden of heavy reading. I also really like the evangelical overtures that conclude each chapter. It makes for good preaching seed-thoughts. Appendix 2: One or Two Temple Cleansings? Appendix 3: Academic Smoke and Mirrors? Appendix 4: So-Called Anti-Jewishness in the Gospels. Paperback, 175 pages of good reading.